Account Administrators can configure the Company Call Handling and Operator Extension settings via the AT&T Office@Hand Online Account. The Auto-Receptionist controls what callers hear when they dial your company number during regular or after hours. You can play a greeting which is a great way to position your company and describe your phone tree, for example: Press 1 for Sales, Press 2 for Shipping, by recording a custom Company Greeting. Callers can enter an extension any time during the message to be connected. Alternatively, you can setup the phone tree so that callers can get connected to a company number, a Call Queue or a User directly. 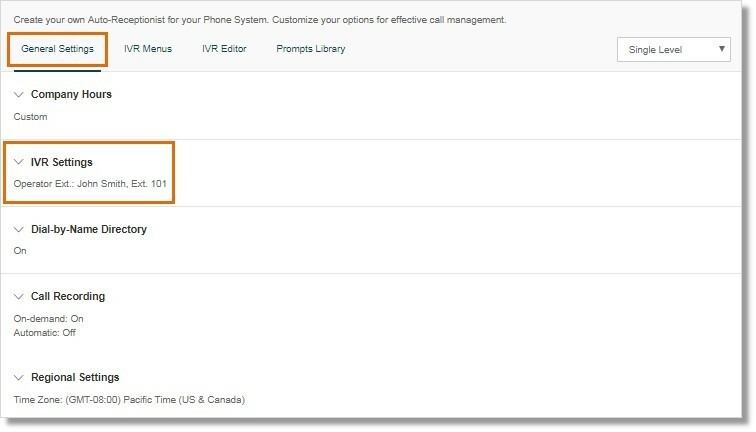 This article will guide Administrators on how to configure your Company Call Handling settings. Log in as an Administrator to your Office@Hand online account. Go to Admin Portal, click the Phone System tab. Go to General Settings > IVR Settings. 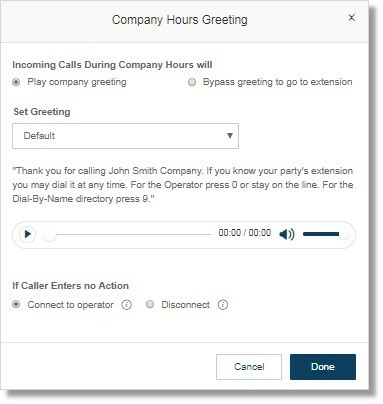 You may edit the Company Hours Greeting or the After Hours Greeting when configuring how incoming calls should be handled. Click Edit to proceed setting up Company Hours or After Hours Greeting. Whether you edit the Company Hours Greeting or After Hours Greeting, you will the same settings. Incoming calls during Company Hours will set greeting if caller enters no action. Play company greeting – Select this option if you want incoming calls to hear the greeting. Note: The answering rule is set to Play company greeting by default. 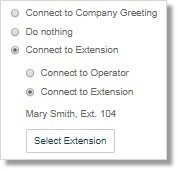 Bypass greeting to go to extension – Select this option if you want incoming calls to connect directly to an extension. You may select an extension. Note: This can be a user extension, a Message-Only Extension, a Call Queue, or an IVR Menu. You may select the default greeting or record your own custom greeting. See Setting Up Custom Company Call Handling Rules for more information. Connect to operator – Select this option if you want to direct callers to ext. 0 after the greeting. 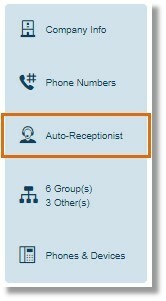 Disconnect – Select this option if you want to disconnect the caller after the greetings repeat three times. You can create custom rules for special routing during holidays, specific time of the day (e.g. lunch break) or for special callers. Click Add Rule to proceed with the setup. See Office@Hand: Setting up Custom Company Call Handling Rules for more information. Callers can press 0 to reach the Operator Extension. Click Select Extension then select the extension that should receive all calls and messages by default. These options are applicable for the whole account for all calls to company number, individual extension or group extensions (like Call Queues). This is the default option that connects the caller back to the Company Greeting when “0” is pressed. Selecting this option will make the system ignore the “0” dialed by the caller. The call continues without change, even if the caller presses “0” repeatedly. This option allows the Administrator to route the call to either the Operator Extension or to the selected Extension when the caller dials “0”. IMPORTANT: The callers will be connected to the Company Greeting when the destination extension is disabled. 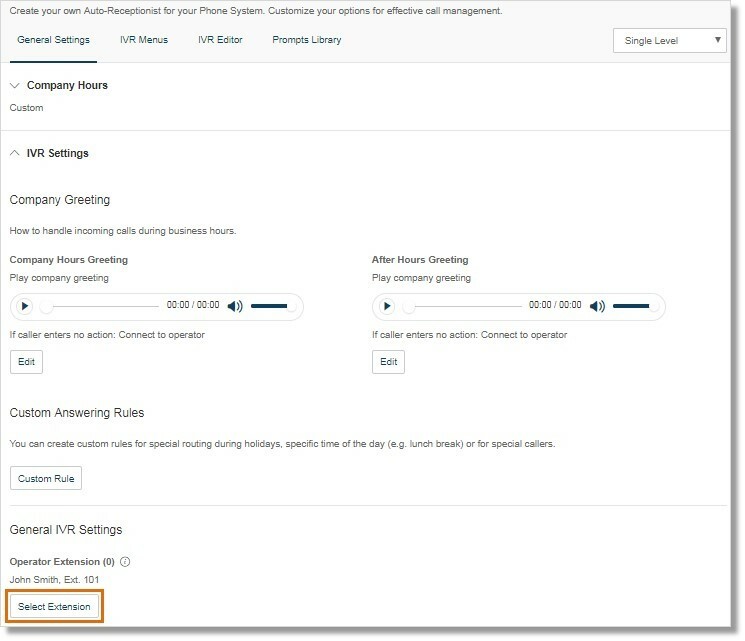 If your company uses a Single-level IVR, this option lets you select to route the call to either the Operator extension or a selected extension. On the other hand, if your company uses a Multi-level IVR, this option will only let you route the call to a selected extension.